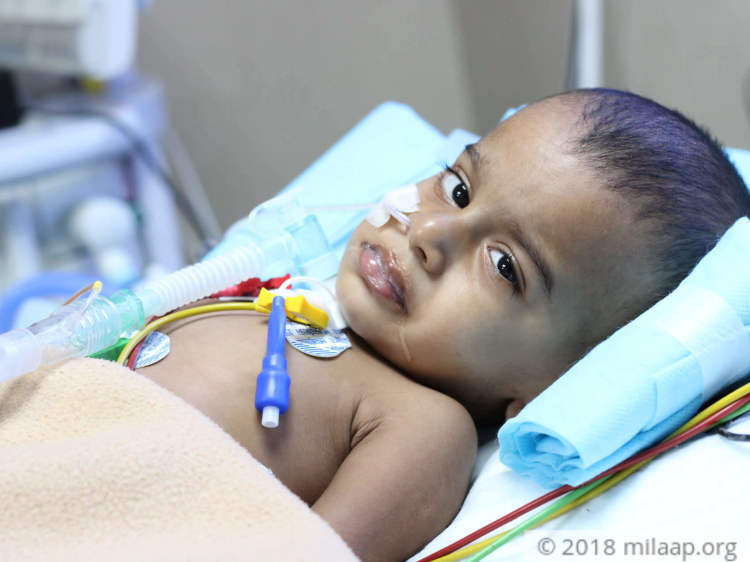 "When he did not gain weight at all even after turning one, we tried different milk powders and medicines but nothing helped him. He had terrible pain when he tried to turn his head but I never imagined it'll turn out to be a tumor. When the tumor was removed I thought with this our nightmares had come to an end but soon I realized it had just started when doctors said that he has a cancerous tumor which will spread rapidly." - Revathi, mother of 1-year-old Sharvesh. 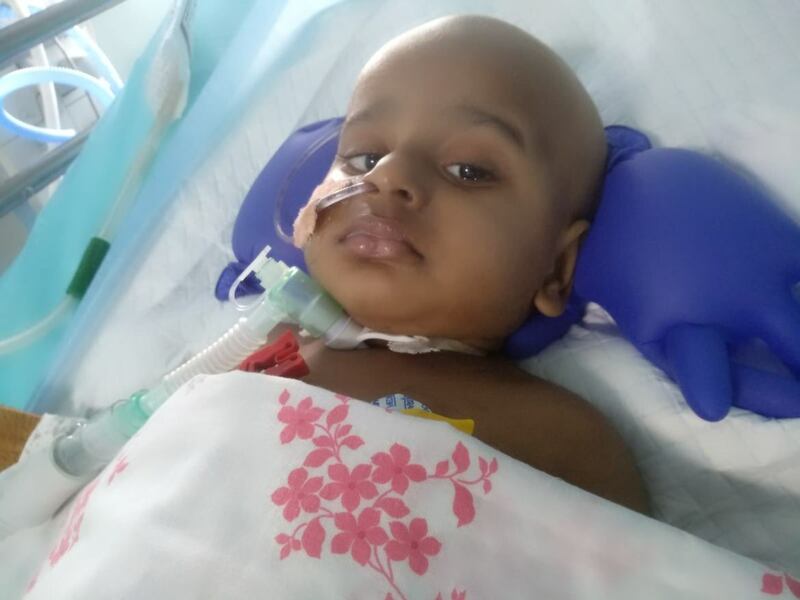 Little Sharvesh is now on ventilator support and battling for his life. He needs intensive treatment to recover completely. His parents are worried that his illness will take his life soon. 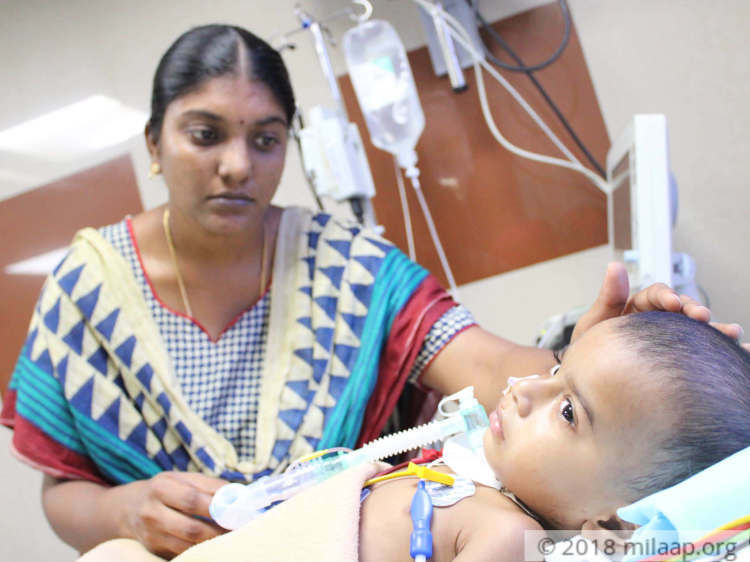 Sharvesh's parents Sasikumar and Revathi took him to different hospitals but nowhere he was diagnosed properly. He was first suspected to have a heart disease and tests were done, but the results were negative. When he became very weak, they brought him to Chennai. Scan reports confirmed that he has a tumor and the very next day an urgent surgery was done to remove fluid accumulation in his brain so that he can m his head. "I was shocked when I heard that he has a tumor. He underwent a surgery to remove the fluid accumulation in the brain. The next day he was active, he was able to turn his head and he smiled. Following week a surgery was done to remove the tumor. I was waiting to take him back home. Finally, the tumor was removed but he got paralyzed and struggled to breathe. I was completely shattered to see him in such a painful condition. He is still on ventilator support." - Revathi. 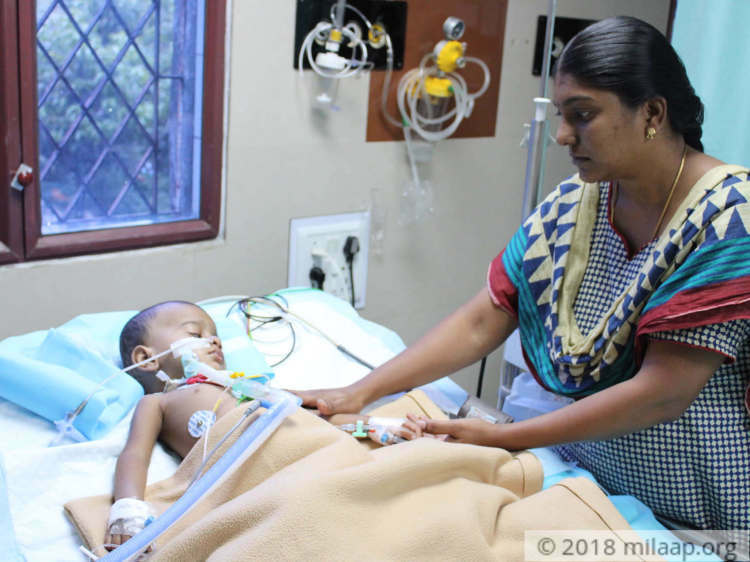 Revathi and Sasikumar were too shocked and they couldn't believe that their son's condition turned critical in just a week's time. 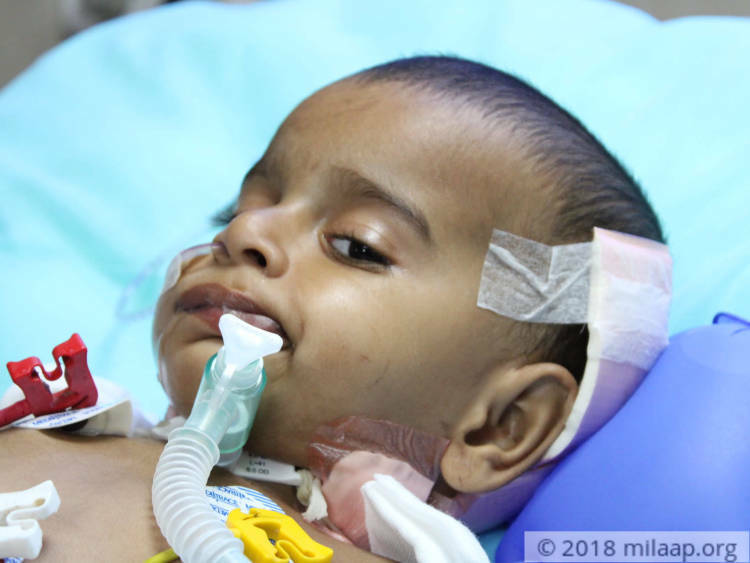 Sharvesh developed severe breathing troubles and he was on ventilator support and his condition did not improve. An immediate tracheostomy was done, it is a surgical procedure to create an opening in the neck for direct access to the trachea. "Doctors said that we can take him home after he recovers from breathing trouble. Every time we begin to feel hopeful, something drastic happens and takes away all our strength. This time it felt like all nightmares have rolled into one. His tumor biopsy resulted revealed that it is cancerous and it can grow rapidly. I can't imagine the pain he is going through." - Sasikumar. Sasikumar and Revathi with their two little children were living a happy and modest life. After Sharvesh's diagnosis, their lives have come to a standstill. Revathi is slowly slipping into depression. She finds it hard to come in terms with the reality. Little Sharvesh has lost his smile and parents are worried that they might never be able to see his smiling face again. The painful journey that lies ahead of him stops them from having a peaceful sleep. "I have spent nearly 3 lakhs so far. I borrowed money from my friends and family. I spent everything I had. When I thought I can take him back home finally doctors said that he needs intense tretament and blood transfusions for next 1 year. My son hasn't even seen the world outside, he deserves a life but I don't know how I can manage to afford his tretament. I'm scared that I might lose him." - Sasikumar. Sasikumar works for a private company and he has spent everything he had for his son's treatment. But Sharvesh has a long way to go, he cannot survive without treatment. He needs intense treatment for 1 more year and supportive care with blood transfusions and antibiotics which will costs around Rs 7-8 lakhs. Parents have exhausted all the sources and now they need your help. I am humbled by the love and support given to Sharvesh. He is presently at home on oxygen support and is being treated with medicines and is doing well. Two cycles of chemotherapy have been completed and he will be admitted for the third cycle after a month. His MRI reports are also stable. He has had some hair loss but is normal as per the doctor. Thank you all for the constant love and support. Please pray for his health. 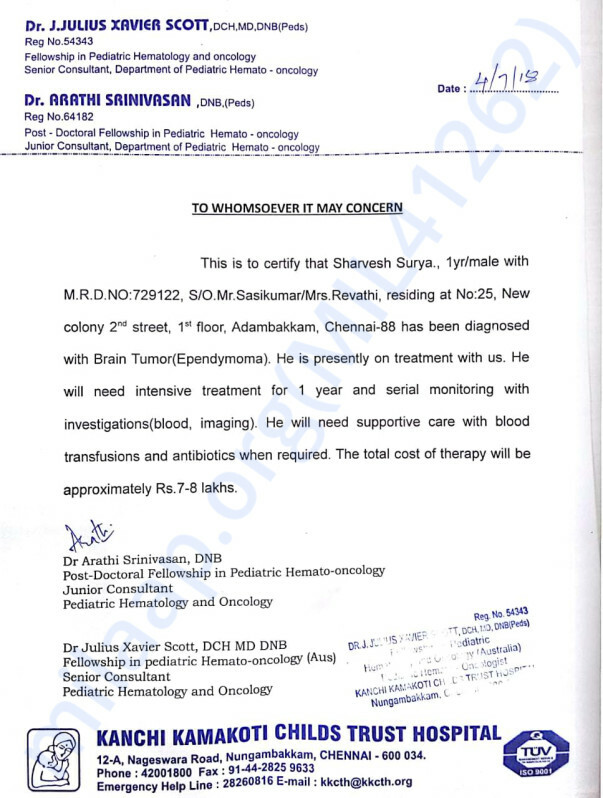 Here is a quick update on Sharvesh's health. Sharvesh is currently at his home and doing fine. He has responded well to the treatment and there are no major side effects as of now. He is on medication as prescribed by the doctors. He has to undergo at least three more cycles of chemotherapy before doctors can decide the future course of action. 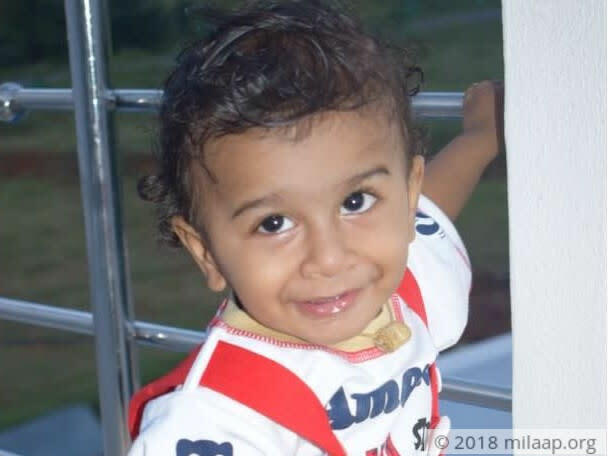 Sharvesh Surya was diagnosed with anaplastic ependymoma in June 2018 and underwent surgery. He requires continuous ventilatory support. He is managed on home-based ventilatory care when he is at home. He has been started on chemotherapy and completed two cycles. He requires frequent admissions for respiratory issues as well as infections. He will need further cycles of chemotherapy as well as assessment periodically.